Option sets allow you to include drop down lists of fixed values to a user within your app to ensure data consistency, sometimes referred to as picklists or choice fields in other applications. 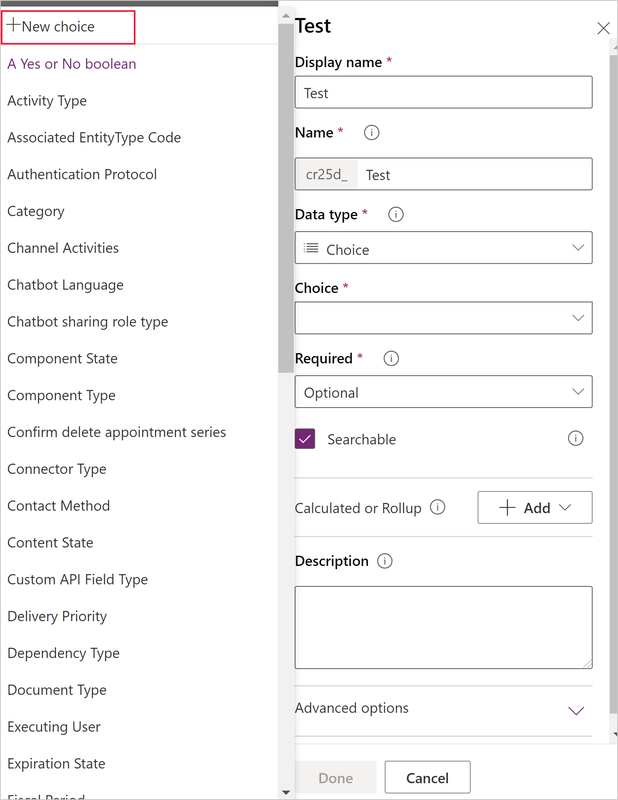 Similar to entities, there are both standard Option sets, and the ability create custom option sets to use within you app. Option sets can be created in two ways, either from the Option set list within the portal or directly within an entity while creating a field. For more information on how to create an entity, see Create an entity. Creating an Option set while adding a field. 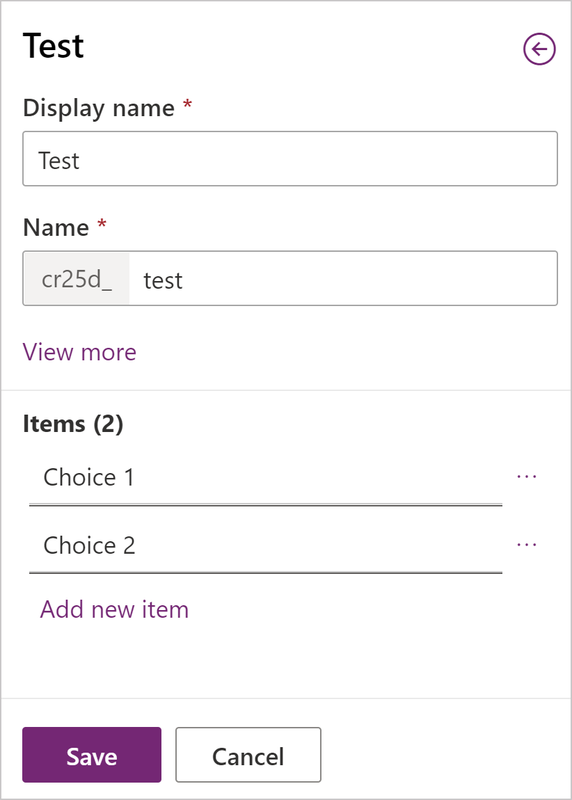 On powerapps.com, expand the Data section and click or tap Entities in the left navigation pane. Add a new field to your entity by clicking Add field. In the new field panel, enter the Display name for your field, Name will be automatically populated and is used as the unique name for your field. The Display name is used when presenting this field to your users, the Name is used when building your app, in expressions and formulas. Click the Data type drop down and select Option set, or Multi select Option set. If an existing option set could be used for your entity, you can select it from this list without creating a new one. A new panel will open to create the Option set, the Display name and Name will default from the name of the field but can be changed if needed. Click Add new item to start creating your list of options. Repeat this step until all your items are created. Once you've entered your items, click Save to create your Option set. Click Done to close the field panel, and then Save entity to save your entity to the Common Data Service. You can select one of your items as the Default for this field, and it will be selected by default when users are creating new records in your entity. 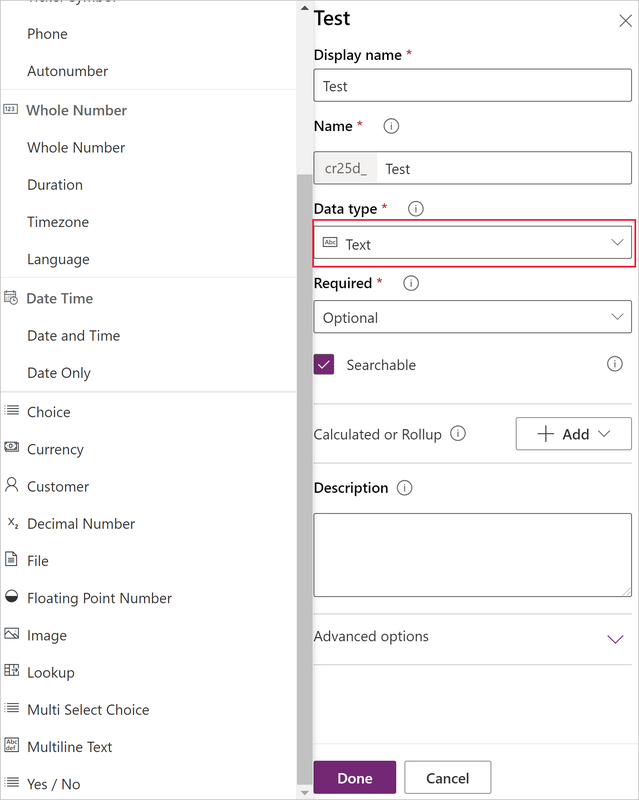 On powerapps.com, expand the Data section and click or tap Option sets in the left navigation pane. A new panel will open to create the Option Set, enter the Display name and Name. Click Add new item to start creating your list of options. Repeat this step until all your items are created. You can now use this option set by creating new field on an entity. By default, Option sets are created as Global Option sets which allows them to be reused across multiple entities. Under the View more option when creating a new Option set you can chose to make an Option set Local. This option is only available when Creating an Option set while adding a field, and not through the Option set list. Local option sets can only be used by the entity and field they are created against, and cannot be reused on other entities. This approach is only recommended for advanced users that a specific need for a local option set. Once an option set is created as local or global, this cannot be changed.